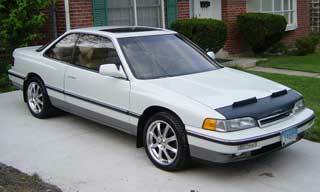 I am writing about the Acura Legend because I own one of these wonderful cars. My family has owned over 20 cars in the last 20 years. We've had this one for nearly four years, and we've been amazed by its performance, handling, features, and reliability for the entire four years and 55,000 miles. It's turned me into a Legend fanatic, and I'd like to share with you the history and - perhaps more amazing - the fact that they're as good now as they were when introduced 20 years ago. In the early 1980s, most of us thought of any Japanese car as a cheap econo box that you bought for great gas milage. No one would have considered a any Japanese car to be a "luxury" car - until 1986. In 1986, Honda introduced a new line of cars aimed at the luxury market. The new line was called Acura, and the flagship model was the Acura Legend. It was like no other Japanese car previously made: It was much larger, heavier, and more powerful than any other Japanese car at the time. It's 2.5 liter 24-valve V6 with programmed fuel injection put out 151 horsepower at 5800 RPM and 152 Foot-lbs. of torque at 4500 RPM. That's a good amount of power. A 2.7 liter 24-valve V6 engine with a slightly redesigned programmed fuel injection system that puts out 161 horsepower at 5950 RPM and 162 Foot-lbs. of torque at 4500 RPM. That's an amazing achievement, because the engine is only 163 cubic inches. That's almost one horsepower for every cubic inch, making it an extremely efficient design. 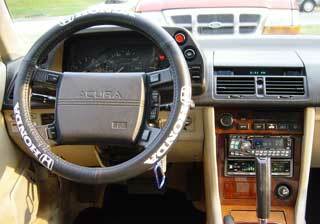 The automatic transmission is a dual mode electronically controlled 4-speed automatic with lockup. It has two modes, "D" (drive), and "S" (sport). In drive, it will upshift (1st - 2nd, 2nd - 3rd, etc.) at a casual rate, but in sport mode - woah, you'd better hold on to your seat! It's makes the transmission hold the gear longer, thus taking better advantage of the engine power that's already there. 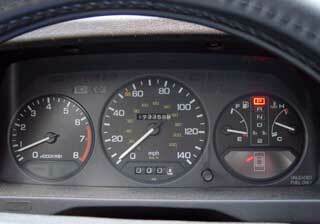 Say you have the accelerator about 3/4 of the way down in D, it will shift to the next gear at about 4000 RPM. In S though, it won't shift until about 5500 RPM. So how does the Legend stack up agents other luxury sports cars of the time? Despite the athletic abilities of the BMW and Mercedes, it is the Acura's powertrain that, in the logbooks we keep, logs our strongest praise: "It's shifter can be best described as Accurate. It's lever action places it among the world's top two or three automatic shifters. It reacts briskly but not abruptly to your command, conducting the engine's output smoothly to the ground, a sterling example of how an automatic should work." The Acura's engine is a marvel of precision, responsiveness, and all the rest that goes with a modern V6. The Benz and BMW powertrains sometimes pause as you apply throttle, but the Legend and the Lincoln show no such signs of indecision, unreeling or reeling in their power proportion to the pressure your foot brings to bear. The Japanese coupe draws the most all-around praise, too-amazing for a car that is $20,000 - $25,000 cheaper than the Germans. The Acura and the Lincoln have better headroom than the German cars. The Acura's rear seat provides the best combination of comfort, headroom, and visibility. 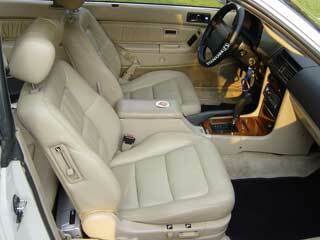 The Lincoln's is probably more comfortable, but it's lack of visibility creates a claustrophobic atmosphere . . . The Acura is sumptuously smooth and very quick. Steering impervious to road irregularities. Stable at 120 MPH, but plenty of wind noise . . . Great seats. Good room overall . . . Steering wonderful-tremendous feel and accuracy. Doesn't get blown around. Everything so easy to use. Although stiff, the Acura's suspension is supple. God, this car is good. What can I say? This is why I love this car - it's every bit as good as Car and Driver says it is. You can ask anyone who owns one, and they'll tell you the same. If you are in the market for a car and can find a Legend for sale, don't pass it up. You won't regret it.